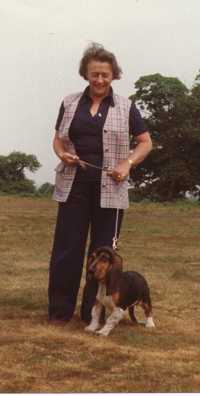 Joan Elliott - Journalist, broadcaster. Joan at 16 aboard "Doric"
My mother was born on January 29th, 1918 in Kingston-upon-Hull in Yorkshire, usually just called Hull. She was the first child of Alfred and Irene Elliott. The name Joan Elliott is the one she used throughout her life for professional purposes. She later had a younger sister, Peggy and a brother, Peter. 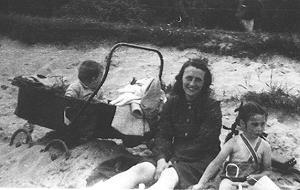 When she was still very young, they moved to the village of Rothley near Leicester. 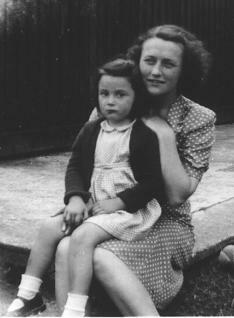 There, aged 4, she met her lifelong friend Isa, who later became Isa Gomme of G-Plan furniture. 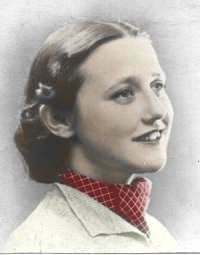 The young Joan was always very bright and passed the scholarship for Loughborough Grammar School. 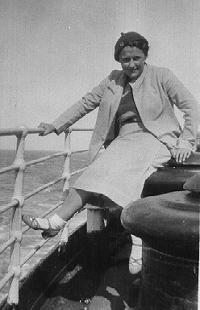 While there, she went on a Mediterranean Cruise in 1934 aboard the White Star Liner "Doric". She liked travelling and this remained with her as she was always intensely curious about the world, and interested in people. It was in the late thirties that she learned to fly at a local flying club, based as far as I can tell at the Ratcliffe Aerodrome near Leicester. 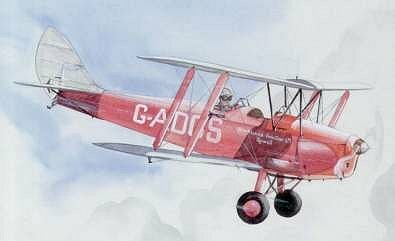 She loved the Tiger Moth and praised its handling abilities and ease of flying. "You can land on a sixpence - just throttle back and it just floats down onto the ground from a few feet up." When 20, she entered her chosen profession of journalism and got a job with the local Leicester Mercury. She must have made an impression because in no time she was off to the Portsmouth Evening News for a more senior post. She told them she was 21 because that earned a higher rate of pay - she wasn't found out until later, and by that time she had proved she could do the job. The advent of war caused a shortage of newsprint and papers were reduced in size, leading to staff being "released". Joan Elliott was one of these but her ambition to be a ferry pilot, taking new aircraft from the factories to the front line airfields was thwarted by her small stature, just five feet and half an inch. She would have loved flying a Spitfire, but would have had trouble seeing out! So she headed back to Leicester where she was able to find some freelance work with the Leicester Mercury. 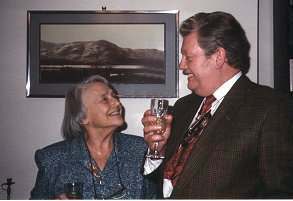 She also met Gerald Nethercot, also a journalist and who was divorced, and the two quickly became close. He volunteered for service in the Royal Air Force and was granted a commission and trained for aircrew. 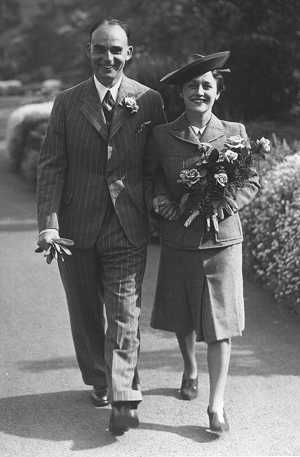 They were married in the dark days of June 1940 with invasion imminent, and spent their honeymoon at the Old Dungeon Ghyll Hotel in Langdale in the Lake District. Mum told me on a visit there in 1995 how amazed she had been at the quantity and quality of the food, describing fresh hams hanging and the delicious taste of it and fresh vegetables, now in very short supply in cities like Leicester. For two weeks there was no war, just the calm and scenery of the Lake District. A love of the Lake District permeates my family! Soon it was back to reality and being a war wife with a husband away on active service for much of the time. In June 1942, Elisabeth (that's how it's spelt) was born and two years later, another daughter, who was stillborn. In need of support, Joan applied to the Mothers' Union, but she was refused membership on the grounds that she had married a divorced man, leaving her for life with a marked antipathy to the MU. This stillbirth had a deep effect on my mother which never left her, despite my arrival on 23rd May 1946. The war was now over of course, but my father was still in the R.A.F. doing intelligence work. He didn't want to leave, but he was needed at home, and was also being offered a job as Information Officer for the City of Leicester. This he took, but soon went to work for the B.B.C. for whom he worked in various capacities until retirement. With her husband at home, life settled down and as conditions eased after the war, and I got a bit older and started school, my mother was able to return to work to feed her hungry intellect. She worked as a freelance for the Leicester Mercury, Leicester Advertiser and did "Women's" features etc. but she also started at this time to work for the B.B.C., mainly for the Midlands Region on a radio programme called "Sunday Out". BBC "Sunday Out" programme, Bredon Hill, 10 August, 1956. 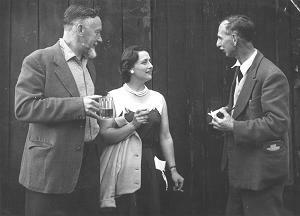 Jack Lloyd, Joan Elliott and Edward Ellis in the yard of the Queen Elizabeth Inn, Emley Castle, Worcs. Of course this involved travelling about all over the Midlands at weekends to prepare the material. She also contributed regularly to "Woman's Hour" and was on the very first edition of the "Today" programme which was broadcast from the Little Theatre in Leicester. She also travelled further afield and visited Paris often, putting her good French to good use. 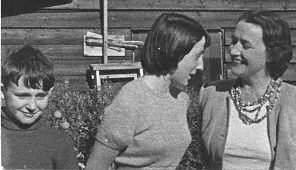 She met and got to know Edith Piaf there among other famous people and stayed at the Chateau Kerdaniel, home of French aristocratic friends in Brittany. After the death of her father in the mid 50s, we had the use of his car, a lovely Wolseley 16. My mother had been able to drive for many years, and had what was called an "All Groups" licence which meant she could drive any vehicle (more about that later). Having this car opened new horizons, and I remember more frequent visits to the Lake District, and it made the annual family holiday to Salcombe in South Devon much easier - I planned the route in those pre-motorway days. My father didn't drive, and this was a bone of contention between them. All too soon the Wolseley went, but we got another car, and my father learned to drive. The relationship between my parents was deteriorating (my mother always blamed the war) to the point when on 1st December 1960, she took my sister and me north to Newcastle-upon-Tyne. There were some former colleagues from the Leicester Mercury working there on the Newcastle Evening Chronicle and they helped find a flat in Gosforth and she managed to get a job with the Chronicle. My parents divorced, quite amicably in the end, and remained close friends to the end. 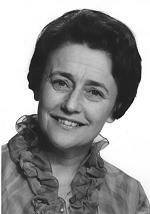 She became Womans Editor and had her own page, the "Joan Elliott Page". But the lure of the microphone was strong and soon she was back in broadcasting, at first with Tyne Tees Television and then with BBC North East, working on publications but also broadcasting. One programme in which she was prominent was "Voice of the People", on regional radio. She married Jeffrey Slack, also a journalist and then the Chronicle's education correspondent (this gave me some cred at school) in 1963 and we moved to Chapel House, west of Newcastle. At my wedding, 1970. 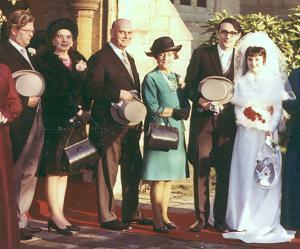 Jeff, Patricia, my father, my mother, me and Christine. 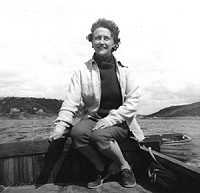 Journalism enabled her to fulfil the ambition of driving every type of vehicle as allowed by the famous All Groups licence. By this time there were just two undriven groups left, but the electric vehicle was taken care of by driving one of Newcastle's now lamented trolley buses (a six wheeler, too) - no passengers on board of course, and later, during a visit, courtesy of the Army, to see Geordie lads in Germany, a "track laying vehicle steered by its tracks" - a Centurion tank! Electronic intro and voice intro to "Joan Elliott Calls", .au format, 182K. "Although most of my colleagues worked like demons on their individual programmes, none could approach Joan Elliott in the sheer time she had to fill all on her own. I had asked her to do a daily programme for women which would not duplicate the rather cosy Woman's Hour of the network. "Five days a week this energetic, slightly pugnacious, often bolshie but altogether ferociously professional woman turned out her "Joan Elliott Calls". It was as gritty as Yorkshire was supposed to be, minced no words and was as relevant to the down-at-heel as to the up-and-coming. No subject was banned from the programme and Joan's straight-from-the-shoulder attitude, which so disconcerted some who met her personally, ensured that no glib answers to difficult problems went unchallenged. And all this singlehanded for most of the time. No wonder people got in her way at their peril." In Richmond Park with "Berfa"
But Jeff earned promotion and once again, they were off, this time to London, where Jeff became first a senior civil servant and later a senior officer in the Greater London Council. 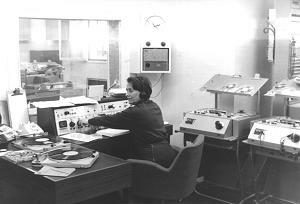 My mother started to work for BBC Radio London, and soon moved up in the news department. By the time she retired she was a senior news editor. The abolition of the GLC by the Thatcher government meant too that Jeff took early retirement and my mother was able to devote more of her time to family affairs, my sister was at this time living only 100 yards away with her husband and two boys. She loved being the grandmother, and was close to William and Edward as they grew up. She also ran a volunteer group in Ham called "Ham SOS" helping elderly people for which she enlisted the help of many of the media people who lived in the area, and arranging transport for them etc., most often driving them herself. They decided to move north again, this time to Durham, partly because Jeff had been at university in Durham, but also because I live in Durham with my family, so she could now be grandmother to Richard and Rachel. It was at this time that health problems started to dog her. While in the middle of the move, she had a cancerous kidney removed at Kingston-on-Thames, and so never saw her house in Durham until she moved in.  Arthritis began to take its toll, but also and most painfully for her, she started to lose her sight with macular degeneration. This is not total blindness, but the centre of vision goes, and she had to give up driving, which she hated having to do, especially as Jeff doesn't drive. Joan loved to walk by the sea. Fortunately, the house in Durham is close to the centre. Undaunted, she set up a self help group for macular sufferers around Durham, enlisted the help of Social Services, organised meetings and a monthly newsletter. Soon the group had over sixty members from as far afield as North Yorkshire and the Scottish borders. The Mayor of Durham, Coun Michael Rochford and the Bishop of Durham, Dr David Jenkins, congratulate Joan Slack, winner of the 1993 Rotary Clubs Vocational Award. 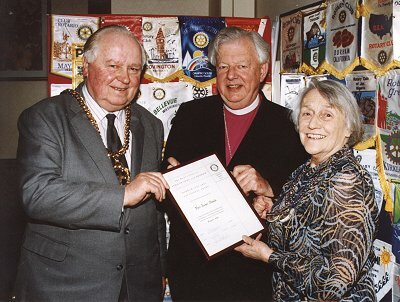 She was given a special award by the Rotary Club in March 1993 for service to the community, presented to her by the then Bishop of Durham, David Jenkins. She and Jeff loved to walk for miles around this beautiful city for as long as she could, but eventually in 1993, she had to have a hip replacement. 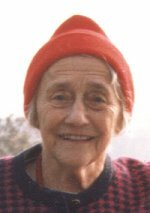 She and Jeff also became active members of the congregation at St. Oswald's Church in Durham, where was confirmed in 1990 at the age of 72. From 1993, the cruellest of ailments then started to attack her, in the very area where she had been always most active, that razor sharp intellect. Alzheimer's disease is called the "Long Good-bye" and justly so. Her alert mind soon realised that something was wrong, and the distress of this was hard for her to bear as she for a long time remained sharp enough to know that her faculties were not what they had been. Much of the time we were able to comfort her with the thought that it was temporary, even though it was not. Jeff looked after her devotedly and as her abilities decreased, he never flinched at the increasing load on him. In 1997, her artificial hip dislocated, and although relocated under anaesthetic at Dryburn Hospital, was never the same again, with recurrent dislocations,seventeen times in eighteen months. The saving grace was that she did not remember the pain afterwards. But each dose of morphine and then anaesthetic seemed to take her a step down with the Alzheimer's. 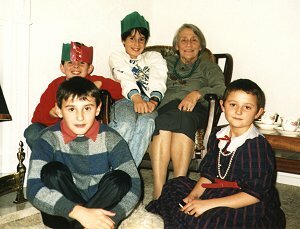 At Christmas in 1997, she was surrounded by family, both children and all her four grandchildren. 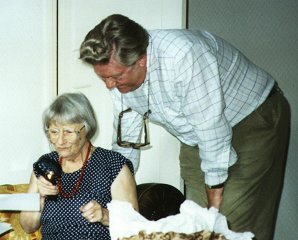 Almost as many were able to be present for her 80th birthday celebration in January 1998. The following day, her hip dislocated again and on discharge from hospital was taken to St. Margaret's Nursing Home in Durham for respite care for Jeff. She spent much time in the office, ensuring that everything was done properly. The staff are good and she was well cared for. After her hip dislocation in March 1998, it was discovered that she had a shadow on her lung, which they were certain was a cancer, and explained the cough that antibiotics wouldn't cure. She did smoke for many years. This meant that the more permanent hip repair could never be done as the risk, according to her consultant, was far too great. This means that even to take her out for a ride in the car, or just back home for few hours, carried considerable risks, but how do you balance this against quality of life remaining? When asked "how long", his informed guess was 'months rather than years'. "No doubt I'll think of other things, there's so much in a life, how do you edit it to web page length? Just trying to capture the flavour of her. Then I think of the frail little figure with her incoherent chatter I saw this afternoon - I cried coming back from seeing her determined somehow to set the record straight, and this is what I can do. She still knew me though, and I could see in her eyes the same feelings that she has always had for me, even though she didn't know where she was or why." Joan was in some ways, before her time. She was independent and ambitious at a time when ladies of her "class" were supposed to be deferent and domestic. She used to say that had she been fifteen years younger, she could have been 'Joan Bakewell'. My mother passed the remainder of her life in the care of St. Margaret's Nursing Home in Durham, where, incredibly tough that she always was, she even managed to walk a little bit, hanging on the rails and getting about despite her permanently dislocated hip. Call it the power of prayer or her own huge willpower, but she survived almost two years after she was given six months by the consultant. Three weeks before she died, the birth of Chloe made her a great-grandmother, which she would have enjoyed immensely - had she been aware of it. The end when it came was peaceful and painless. 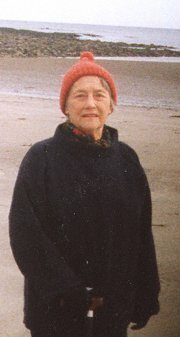 My mother, Joan, died at 4:45pm BST on September 8th 1999 in Durham, aged 81 years. The Funeral was at St. Oswald's, Durham.